Water for Coal: Thirsty Miners? It seems like there is more chatter about coal lately. Perhaps it is the unrelenting smog in the capital that has brought the issue to the forefront. But now, coal might not only be blamed for the country’s deteriorating air quality, it could also be sucking grasslands dry. The focus is shifting from the detection of heavy metals in PM2.5, to concern over water for used for coal. Water for coal – what’s the big deal? Extraction & production of coal is water intensive. 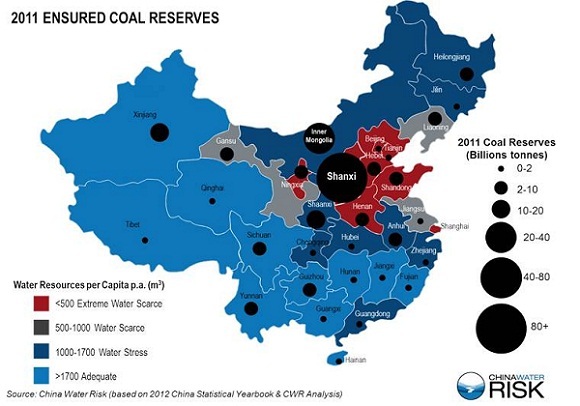 In China, there is lots of coal and water – but just not where we want it. What makes this worse is that water resources have been falling over the last ten years. It is this shift in the water landscape as well as a rise in the demand of coal that is causing concern. Miners & investors in mining beware! But this is now. By 2015, the government plans to ramp up production to 4 billion tonnes. Is there enough water for this? If not, what does this mean for the coal industry? The CLSA Report warns that this might not just be a problem for China’s coal but also for Mongolian coal washed in Inner Mongolia. With power, we had been discussing this back in April 2012, culminating in a report for HSBC called “No Water, No Power” (see here) but it is always nice to see Bloomberg New Energy Finance (BNEF) shares the same view, having recently published a report on water & the power sector. Just to give you an idea of the size of capital involved, they believe that US$20billion will need to be spent on making existing power plants in water scarce regions more water efficient AND this doesn’t include the 1.5TW China is intending to add by 2030. According to BNEF’s Nathaniel Bullard, ““business as usual” scenario, the country will see 25% of its water going solely to power plants by 2030.” More on why BNEF think Chinese power utilities are in hot water here. 64% of farming land also lie in the North. Since we can neither move mines nor farmland, which is more important – food or energy? Since groundwater is the only source of water for many cities in China, it is not surprising that the government is directing focus to groundwater protection. Also, public anger & concerns over contamination brought on by unsubstantiated accusations in February by micro-blogger of chemical plants and paper mills in Shandong using high pressure pumps to dump their hazardous chemical waste underground may have also something to do with it notwithstanding the official recognition of “cancer villages”. Yes, bad air, dirty water, chromium rice, dead pigs, cancer villages do not help. The people are worried. The government is reacting with Li Keqiang acknowledging that “we shouldn’t pursue economic growth at the expense of the environment. Such growth won’t satisfy the people” and promising to “show even greater resolve and take more vigorous efforts” in tackling pollution. The public participation in cleaning China’s water, soil and air are also encouraged. At the same time, the government is moving ahead with protecting groundwater. The State Council approved on March 8th the North China Plain Groundwater Pollution Prevention and Control Work Program which was jointly prepared by the Ministry of Environmental Protection, Ministry of Land and Resources, Ministry of Water Resources, and Ministry of Housing and Urban-Rural Development. The first phase will involve groundwater quality & pollution sources monitoring network to be established by 2015 to identify key sources of pollution. It is envisioned that by 2020, a comprehensive monitoring of groundwater environmental quality and pollution situation in the North China Plain will be in operation for effective management of groundwater pollution risk. More smoke? Maybe not, judging from the number of ministries involved and the RMB34.66 billion set aside for this. Is this bad news for coal? 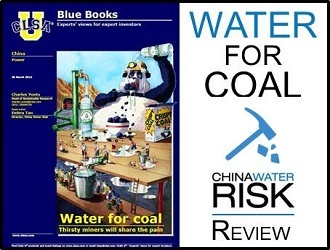 Could China’s coal industry face a “Peru Water Wall”? Earlier this year the Peru Water Authority rejected a permit for Newmont Mining to extend its Yanacocha gold mine on the grounds that it would pollute the Rio Grande river, which supplies water to 70% of the region’s residents. Although Newmont is trying to make amends with the local communities, building reservoirs and other water projects, according to Forbes, their statement in their 2012 annual report may give an indication that it is looking for an exit strategy: “while it remain committed to the US$4.8billion project for the time being, continued opposition may force it to divert investments elsewhere.” This brings about the question – how do you value ensured reserves in water scarce regions? Either way, all four options will raise costs or need capital. Chinese coal companies are “under-invested” at the moment. According the CLSA report,”the three majors, China Coal, Shenhua Energy and Yanzhou Coal spend less than 0.5% of their total revenue on environmental protection. Chinese companies are only at the very start of their journey.” Perhaps they should follow the government and start investing in protecting water groundwater sources. Extracting groundwater and cleaning it for villages may be good but are you encouraging depletion at an unsustainable rate? Only time will tell, and by that time, it may be too late. Cancer Villages: Toxic Tipping Point? Cancer villages are not new in China but with official recognition in 2013, we reviewed 255 media reports of such villages to look at their spread, what this means for farming and industries that may be responsible. Is this the start of a long costly road to clean up? Chinese Utilities in Hot Water BNEF’s Nathaniel Bullard shares key findings of their report including the exposure of China’s Big 5 power companies to water risk. Can China afford to see 25% of her water going sole to power plants by 2030? Or should she prioritise agriculture or cities? Water in Mining: Disclosure Overview The international mining sector leads the way in water disclosure, but with massive regional variations in the level of reporting and poor current reporting frameworks are investors getting the full picture?